One of my perennial New Year’s resolutions is to eat more veggies! This year I might even succeed at it because I have discovered the key to potential success: make it something I look forward to! And that means finding ways to make meals that fill me up by adding adequate protein and taste really good. One of my favorite dinner combinations is a nice hot bowl of veggies, noodles and sauce made with Maisie Jane’s almond butter. Vegans and vegetarians will love this recipe. The almond butter and roasted cashews in the sauce add the needed protein and flavor I crave. 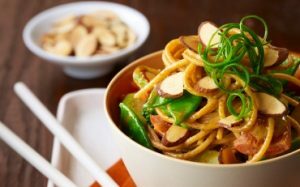 Serve it over whole wheat or other noodles and your favorite steamed or sautéed vegetables for a tasty evening meal. I like the combination of broccoli and snow peas for this but any combination will work. I usually add a little cubed baked tofu, as well. Want to make it spicier? Add a dash of chili-garlic sauce, such as Sriracha, and a squeeze of lime. Sauté onions and whole garlic in oil. When onion is tender, crush garlic with a fork and mix in. Add ginger and pepper. Cook gently 1 min. Stir in almond butter and soy sauce or tamari, then water and celery leaves. stir until smooth. Simmer about 5 min. Add roasted almonds and heat through. Serve over steamed veggies with tofu and whole grain noodles.